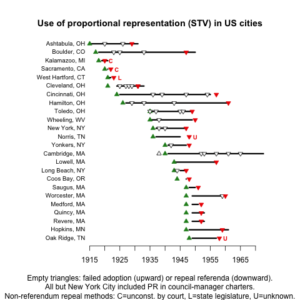 Some have asked me to share a chart I made of PR’s history in American cities. Here it is. 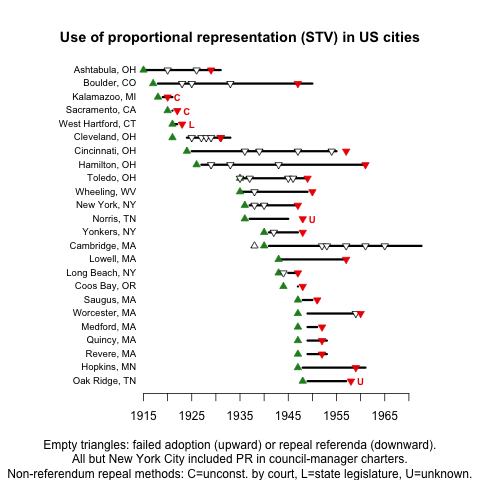 All cities used the single transferable vote (STV), better known today as multi-winner ranked-choice voting. Data are from Childs (1965), Weaver (1986), and my research. See “Party splits, not Progressives: The origins of proportional representation in American local government” (American Politics Research, November 2016) for more information. The above graphic is licensed under a Creative Commons Attribution-ShareAlike 4.0 International License.